We interrupt this regularly scheduled Tunesday to bring you something more timely. Sunday brought the long-anticipated White Rock Dallas Marathon. After having a less-than great showing at the Oklahoma City Memorial Marathon last April, I set my sights on this race as my running redemption. I trained better than I ever have for my third marathon. In addition to regular sessions at White Rock Lake and long runs around East Dallas, I spent many early mornings (4 a.m. alarm) heading for the hills of Lake Highlands subdivisions. Up to twice a week, I ran up and down these substantial hills (for flat Dallas) seeking to get stronger and faster. A good showing at the DRC Half last month was encouraging; but you just never know how one's fitness will translate over twice the distance, and you just never know what race day will bring. For starters, race day brought humid, 70-degree temperatures. This wasn't a surprise; and while it wasn't ideal, it didn't bum me out terribly. Last year's marathon, it was 40 degrees, windy and wet. Texas presents this meteorological mixed bag. You can't predict weather in December, and complaining about it won't change a thing. Instead, I entered the race with a plan to dump water on my head and drink at every water station in addition to maintaining a two to three Endurolytes per 30 minute regimin. Pre-race: Caged in corral A with fast Matt Florence. Folks with G-town ties represented strong at this race. My buddy Steve, who also has Garland roots, finished his first 26.2. The race started in downtown Dallas, as opposed to Fair Park in recent years. The course took runners across the Trinity River and through a 4-mile loop of West Dallas. The spectators in this section were excellent — among some of the loudest on the entire course. I could easily hear them over my music. The highlight was running across the much-publicized (and vilified) but, IMHO, impressive Margaret Hunt Hill Bridge. The first 6 miles, I was cruising — averaging 8:08 miles (so says this graphic), which admittedly was on the fast side (gotta work on tempering the excitement). I was keeping up with the 3:35 pace group (not my goal) but knew I would need to slow down if I had any hope of making my real goal. There was way too much race left to run too fast too early. So I let off the gas slightly as the marathon course headed northeast into Turtle Creek. My body-temperature regulating plan was doing the trick, but I started to notice a side effect of dumping all that water on my head — the runoff was collecting in my shoes. By mile 9, I could feel an enormous blister forming on the bottom of my right foot. It didn't hurt yet; but I knew it was going to be a nagging annoyance for the remainder of the race. I have no idea who that guy to the left of me is; but he might be an extra from "Bill Swerski's Super Fans." 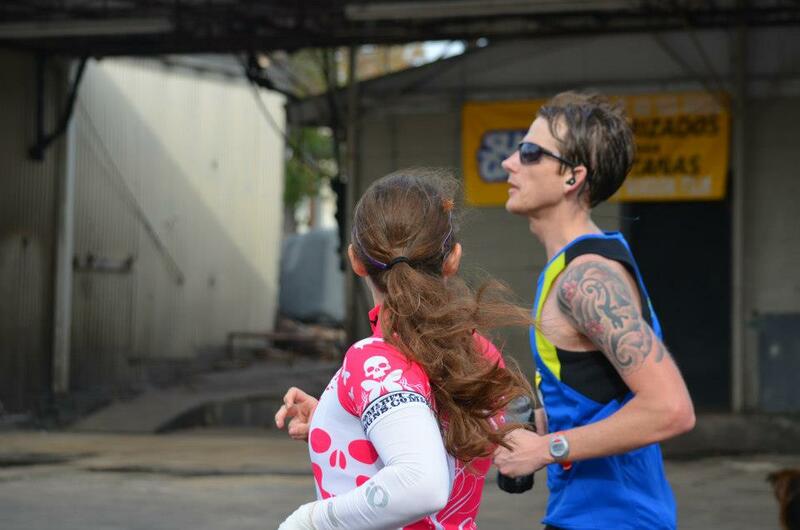 Mile 11 brought encouragement from my awesome sister and That Pink Girl. Knowing that these spectathletes would be at this spot cheering made the first half of the race enjoyable. With a pep in my step and en route to White Rock Lake, I crossed 13.1 at 1:47:32. The back half of the race was supposed to be easier this time around. A good portion of the course follows the trail I train on all the time. A homefield advantage. But my increasingly painful foot and overall fatigue started to take their toll. By mile 16, I needed to take walk breaks. And even when I was running, I had to find motivation by setting goals — such as reaching random objects that were 100 yards ahead and keeping pace with people in front of me. The good news was the blister hadn't popped (gross, I know; just be thankful I'm not one to post funky foot photos on my blog). If it had, I probably would have required some medical attention, which would have derailed any attempt at reaching my goal. Leaving the lake portion of the course provided a bit of a boost. Sure, one of the tougher stretches — the aptly named, back-to-back Dolly Partons Hills — lay in front of me. But that also meant I'd see a friend, EK, one of the better-dressed, cheering spectators dressed as Dolly Parton (get a load of him in this pic and this pic). He ran alongside me up the second hill in his getup, offering encouragement as he held water in one hand and beer in the other. At this point I was at mile 20; stretching my tight legs was now an every 6 or so minute routine. The 3:45 pace group had passed me earlier, and I was fearing I would see the 4:00 group eclipse me any minute. Fortunately I knew I had one more opportunity to see friends at mile 21. And I did. Fiona, TPG, Dat and Mama C were there and I was struggling. At this point I really felt like I was just barely putting one foot in front of the other. It only felt that way, because I still was managing to average 9:30 miles. Mile 21: This is one of the shots where I don't look like death warmed over. Sometimes all it really takes is a good pep talk. TPG gives the best ones. With about 5 miles left, she reminded me that I could indeed do anything for 5 miles. 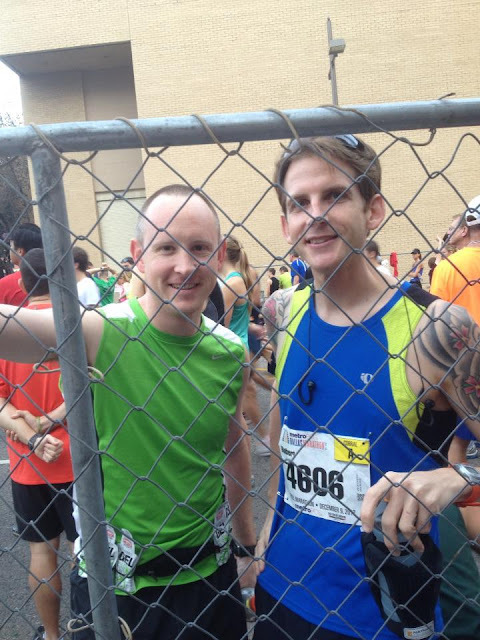 TPG cooked up an elaborate spectating plan to see several runners at the Dallas Marathon. Each was thrilled to see her on the course. Even though I felt like hell at this point, I will gladly run any distance if it leads me to my favorite Pink Girl. I was re-energized emotionally, but I still was pretty damn tired, and my barking right dog was negatively affecting my form. The last section of the race was through historic Swiss Avenue. This neighborhood is filled with architectural marvels; but I barely noticed the estates as I concentrated on small milestones — again motivating myself to run to the next stop sign or intersection and then reevaluating how I felt before choosing the next inanimate object to push toward. Next thing I knew, there were only about two miles remaining. I was in Deep Ellum, scene of many a club show and late night ridiculousness in my late teens and early 20s. Back then I would have never imagined I would willingly pay to run down Elm Street. The view exiting Deep Ellum was spectacular. Downtown Dallas' remarkable skyline welcomed runners as we entered the final stretch toward the convention center. Motivated to move by the ticking clock, I gave it all I could. It felt like I had very little energy left in me; but I kept on moving. I knew there would be a good crowd at the finishers shoot, including my friends. I grimaced as I tried to find another gear for the final quarter mile. In pain but determined to meet my goal: I don't remember seeing other runners on the course at this point. Focused. My calves started to seize up, but I kept moving forward. I made the last turn and could see the clock in front of me. I moved faster. The digits on the display increased. The distance between me and the finish line decreased. The next thing I knew, I had crossed the line. 3:59:23. That was my goal. Well, not that number exactly. But under 4 hours. And I just made it. But truthfully, if I had put the same effort into the race and finished at 4:00:01, I still woulda been thrilled. Why? Because I ran the best race I could on that day. I felt awful at the finish line. My body was ready to shut down and not move for several minutes. I obliged. I left everything on the course. And that felt effin' fantastic — y'know, in a "This hurts like hell" kind of way. It's worth the pain sometimes. It's not every day that I accomplish a goal like this — I chopped 38 minutes off my PR from last year (4:37:27). I paid my dues and earned it. I learned a lot from friends along the way, too; their experiences, blog posts and advice have been invaluable. They've tackled immense challenges, have overcome odds and have been phenomenally inspirational. Thank you, thank you and thank you! So, what's next? I'm not sure; but I have a few thoughts. After the restful holidays I'll figure something out. Because life's too short to not pursue the extraordinary. A. We all already know that you are extraordinary - ask anyone. Mission already accomplished! B. CONGRATULATIONS on a big, fat PR! Daaaaang, when you set your sights on a goal you make it happen, Capt'n! Good for you! Enjoy your success - you earned it!!!! Love this, love this, love this!!!!! Congratulations on a phenomenal race in very less than stellar conditions!! Great to see you and to have our picture on your blog post! That was a really tough day. Amazing PR. I can't wait to see what kind of time you have in you when the weather is better. Blazing! You. Are. Awesome. To come out there and run like that on the worst day ever....wow! 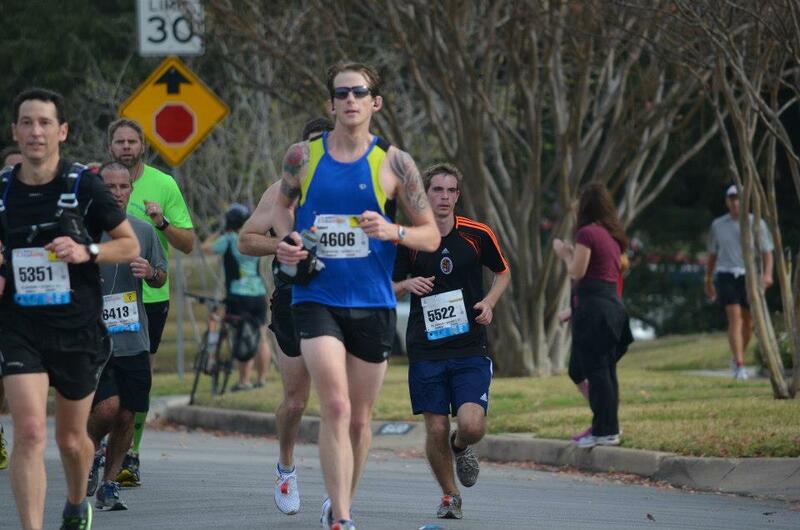 I had my thoughts on all y'all marathoners as I fought my own battles on the half course. I was thrilled when I heard that you met your goal. I'm glad that Mr K could be of help too, he LIVES for Dolly Day!